Hoss Brown tends bar at the Veterans of Foreign Wars (VFW) Post 4676 in southern Universal City, not far from the main gate into Joint Base San Antonio-Randolph. He lives in a Schertz neighborhood near the Air Force base. Brown is used to the daily sights and sounds of trainer planes and jet fighters flying overhead. He loves the scene and says he never worries about aircraft-related accidents. Brown said he’s amazed by the amount of residential and commercial development that has taken place around Randolph in the last 20 to 30 years. But he is not fazed by the civilian growth or activity happening on base. “You know [the base] is there, so you adapt to it,” he said. Adapting to growth is something local civilian governments and military commanders have in common. 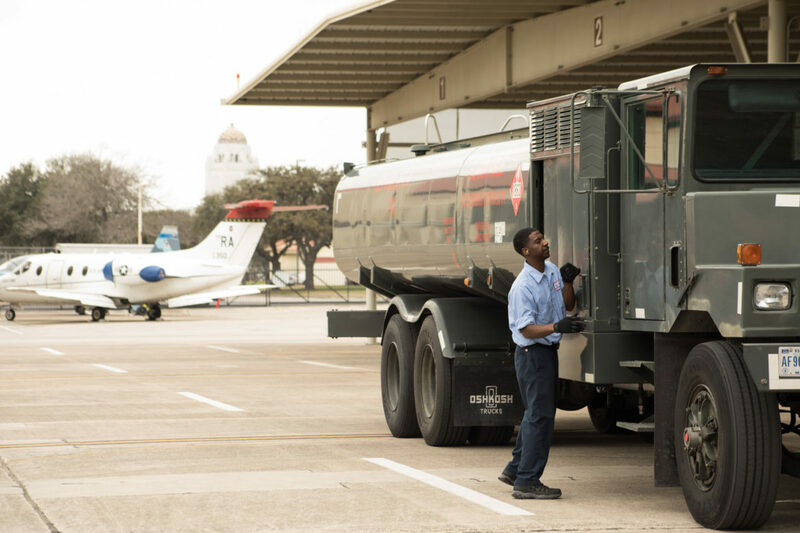 Randolph’s neighboring cities, Universal City and Schertz, are doing what they can to ensure their growth does not adversely impact the military mission. At the same time, the U.S. Department of Defense is working with these and other communities to ensure that civilians living and doing business near Randolph are comfortable with the level of aircraft noise and safe from potential accidents. At a time when the federal government is calling for greater efficiency in the armed forces, this may be more important than ever as local officials push San Antonio as a prime place for even more military missions. Maj. Gen. Juan Ayala, director of the City of San Antonio’s Office of Military Affairs and a former Marine, said one of his office’s principal goals is to ensure the San Antonio area’s continuing growth does not overwhelm any of the active military facilities. Outlying communities surrounding Randolph such as Converse, Schertz, and Universal City had existed long before the then-Army Air Corps opened an airfield in the area in 1931. Hundreds of thousands of people have since flocked to the region to settle down outside San Antonio’s city limits. The population in the small cities surrounding Randolph including Universal City, Schertz, Converse, and Cibolo grew 48 percent – from 70,085 to 103,755 – between 2011 to 2016, according to the latest American Community Survey population estimates. Randolph employs 9,400 military and civilian personnel. Home to the U.S. Air Force’s 12th Flying Training Wing and the Air Education and Training Command, Randolph oversees more than 210,000 flight operations annually. 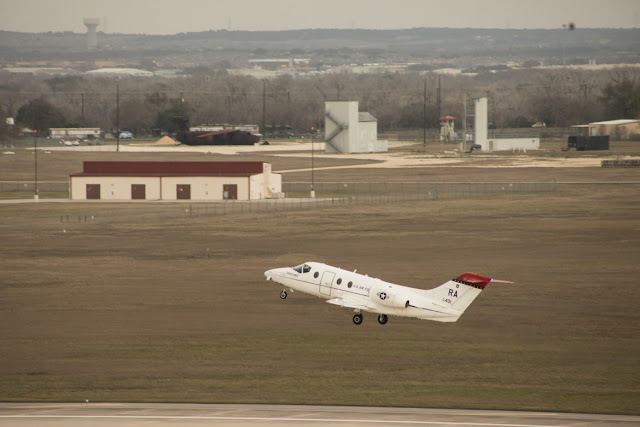 The total economic impact of Joint Base San Antonio that includes Randolph in 2015 was more than $48.7 billion, according to the Texas Comptroller of Public Accounts. Some cities like Universal City have no more unincorporated land to annex and expand their city limits. Other cities have space within their city limits to continue their present surges of commercial, industrial, and residential development. Through it all, leaders of these communities strive to maintain a close and productive relationship with Randolph, keeping base command updated on developments across the areas surrounding Randolph, which has come to be known as the Metrocom. Officials such as Ayala believe encroaching development, if not regulated, could make Randolph or other local facilities a target for a future round of Base Realignments And Closures (BRAC). But another round of BRAC will not come sooner than 2021. Leaders of Randolph-area communities agree a proactive, conservative approach with the military is the best way to protect both the base’s mission and how surrounding cities regulate their development and growth. Ayala agreed that the relationships among Randolph, other local bases, and neighboring cities have remained strong over the decades. Doug Opersteny, 12th Flying Training Wing community initiatives chief, said his team works closely with the local communities on a regular basis to ensure compatible land use around Randolph and the Seguin Airport, which for years has hosted a base auxiliary field for training takeoffs and landings. Compatible land use, or the best use of land surrounding a military installation that does not conflict with the base’s mission, is a guiding force for area military and civilian leaders. The Department of Defense has periodically studied the evolving needs of facilities and how the neighboring communities can best maintain their level of growth without affecting the military mission or civilians’ safety. Department of Defense and Randolph officials worked with surrounding counties, state and federal agencies, and other stakeholders over 12 months to produce in July 2015 a joint land use study (JLUS) for Randolph. The JLUS is a big-picture look at how Randolph and its neighboring stakeholders could agree on best land-use planning practices and improving communication. Additionally, the military has spent the last few months previewing to the public an updated Air Installation Compatibility Use Zones (AICUZ) study. The AICUZ study, periodically conducted by the Department of Defense, is more technical in nature and more detailed in its analysis of effects from aircraft noise and accident potential on neighboring communities. 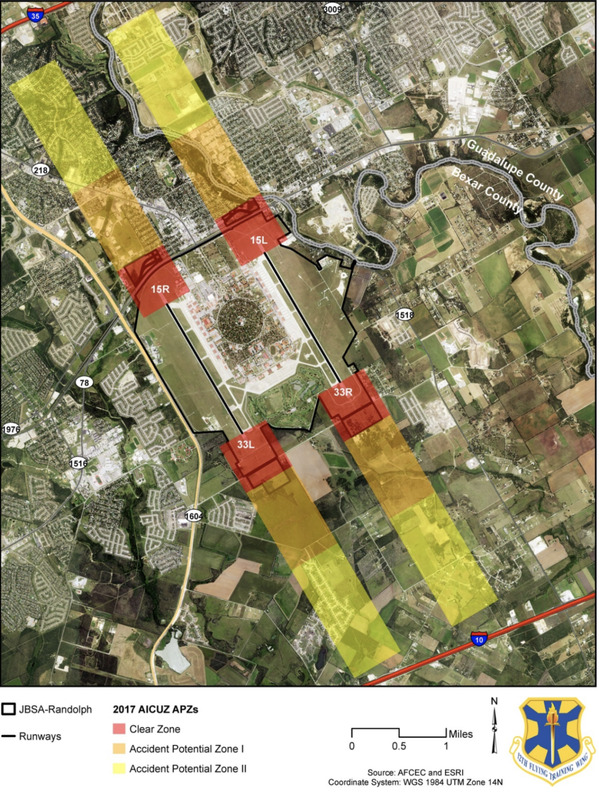 Randolph’s operational footprint, according to the JLUS, includes accident potential zones (APZs) and noise contours, both of which affect development surrounding the base. There are three APZs at Randolph: APZ I, APZ II, and a Clear Zone. The clear zone measures 3,000 feet wide and stretches 3,000 feet from each end of Randolph’s east and west runways, north and south of the base. The APZs extend thousands of feet further out from the clear zones. The zones are areas where aircraft accidents are most likely to occur if they do happen. The last accident to take place on base was in July 2013 when a T-38 Talon jet belly-landed on the east runway; the plane’s two instructor pilots were not hurt. The last fatal crash at the base occurred in March 2003, when a T-38 veered off a runway and hit a barrier stanchion; one pilot died. The Department of Defense also identifies noise contours, which assess relative aircraft noise levels around a military airfield as a planning tool for local civilian agencies. Noise exposure is measured using an average of cumulative noise exposure resulting from base operations over a 24-hour period. Increasing diversity of uses in surrounding air space, including the operation of drones and similar unmanned aerial vehicles. Recommendations on these and other issues are numerous throughout the JLUS, including more restrictive density and land-use guidelines around the APZs and noise contours south of the base. Compatible uses recommended in the 2015 study include: Residential development of one house per 10 acres within the southern APZ II on the west runway and residential development of one house per 20 acres within the southern APZ II on the east runway. Denser development is incompatible in these areas. Development within the southern APZ I along both runways is considered incompatible with base operations, as is residential development in any noise contour where the day-night average sound level is 65 decibels or louder. For comparison, the noise a vacuum cleaner generates is about 70 decibels. Neighboring stakeholders pledged to respond to those concerns. Bexar County officials agreed in 2016 to purchase 91 acres of land in order to create a new buffer zone around Randolph, using $1.3 million in County funds and $4.7 million from a grant awarded by the Texas Military Preparedness Commission. The County carried out a previous acquisition of another 51 acres around Randolph. Altogether, these property buyouts were valued at $10.7 million – all to support the formation of a 142-acre buffer zone in which no civilian development is allowed. Another issue raised in the 2015 JLUS is a need for improved communication between Randolph and its neighboring cities when it comes to land-use issues. Kim Turner, Universal City’s development services director, said base officials would like to be updated on civilian development plans in a more timely manner. In doing the 2015 JLUS, base officials inquired about the beginnings of civilian developments that now fall into the paths of newly expanded accident potential zones. Two such examples in Universal City are part of the 178-acre Northlake Business Park and Veterans Park, an eight-acre public park with a network of walking trails and views along Cibolo Creek. Part of Aviation Heights, a decades-old neighborhood in Schertz, fell into a then-smaller AICUZ pathway outlined years ago. For Schertz’s part, nothing can be done about inhabited neighborhoods, Carpenter said, other than to ensure emergency first-responders are equipped and trained to respond to a local incident off or on base in which aid from multiple agencies is needed. “But no businesses were built in that area without Randolph knowing about it,” Turner said about the park property inside the zone. Instead, the land there was dedicated to distribution and warehouse uses. The Veterans Park land was once slated as an apartment development, but was deemed too close to a base runway. Universal City bought the property and turned it into a small park, used mostly as a trail head. Turner said it was not a case of Universal City defying the wishes of Randolph personnel who were keeping their eyes on compatible land uses. “People at Randolph probably didn’t even know what happened with the land originally,” she said. Universal City has 198 acres of mostly undeveloped farmland in its extra-territorial jurisdiction next to Schertz, within an accident potential zone. The city has no near-term plans to formally add the acreage, which has been designated mostly for commercial zoning with the potential of some residential zoning. Turner said the 2015 JLUS was also helpful in that it emphasizes more timely digital exchanges of information between Joint Base-Randolph and the neighboring cities. “Every single time something new [proposed development] comes up, [cities] send a package to us, we get to review it, and we say according to AICUZ this is compatible or is there something we can do to make it better, where we both get something out of it,” said Lt. Col. Paul Strom, 12th Flying Training Wing Community Initiatives. Civilians who live and work in the towns around Randolph tell the Rivard Report they appreciate how the military helps keep them safe from adverse effects of the base’s aircraft operations. U.S. Navy veteran Roland Thornton, who lives in Universal City, recalls the fatal collision of two Blue Angel jets above Lakehurst Naval Air Station in New Jersey in 1973. But the potential for such an incident around Randolph doesn’t concern him. “Sure, you never know. Anything could happen, but I’m not worried about it,” he said. The same goes for Mandy Masson, a Schertz resident who works at a dog grooming shop off Pat Booker Road, the main Universal City corridor leading to Randolph. Converse resident Diane Wallen spent some years working at Boysville, the children’s home and shelter in Converse near Randolph. She said she hasn’t had any issues living or working near the base. Brad Lacy, vice president of marketing for Pulte Group in the San Antonio market, said restrictions around Randolph occasionally make it difficult for developers to build homes at affordable prices. “The municipalities and government officials creating and/or enforcing these guidelines have been great partners to Pulte Group, and we all believe the safety of the citizens of Schertz, Universal City, and Converse is paramount,” Lacy said. All involved – military and civilian – agree the AICUZ and JLUS initiatives, among others, help keep communities safe and preserve military missions.